Warning: The blog you are about to read contains the rantings of someone irrational nearly to the point of insanity on this particular issue. Reader discretion is advised. Because I receive email alerts from the Foot Dragging Administration, I’d long known that foods recalls due to undeclared allergens happen just about daily. Fear set in, though, when I saw a bottle of salad dressing with green flakes floating in it but no indication of spices on the label. While I suppose it could have been a bad mold problem, it looked like herbs to me. And today, I am ready to dig up the back yard come spring, buy a cow and refuse to feed Big Guy anything that I didn’t monitor from start to finish. And I’m a lousy gardener. The Chicago Tribune, in a fine piece of investigative journalism just waiting for someone to pursue it, pulled it all together. The picture’s far scarier than I imagined. 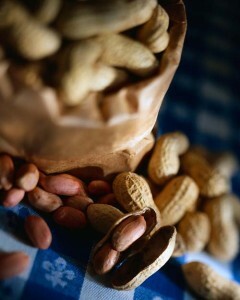 There have been 2,800 recalls related to food allergies over the last 10 years. Hidden allergens account for roughly five recalls a week, making contamination — and there’s really no other word for it — one of the top reasons any product in America is recalled. Nearly half of the allergy-related recalls weren’t announced, even when the FDA classified products as likely to cause serious harm or death. Testing the Tribune commissioned showed levels of gluten “not safe for people with wheat allergies or celiac disease” in one particular brand of chicken nuggets labeled gluten-free. Dear heaven. Don’t these companies get that they can kill people? I don’t expect a pristine allergy-free food supply. I understand that cross-contamination is going to occur during production unless manufacturers take steps so extreme that food becomes unaffordable for everyone else. I’m not asking anyone to do that. All I’m asking is that you freaking tell me what’s in the food. The FDA, meanwhile, does nothing. Officials know this country’s labeling system is inadequate. They know they’re holding back information consumers need. They’re powerless to require recalls, and when a company decides to issue one, the FDA frequently lets the business write a version loaded with feel-good language. Whether it’s due to bureaucratic apathy or a regulatory agency too cozy with the industry it’s supposed to regulate, I don’t know. But I do know that as more and more people are diagnosed with food allergies and celiac, the FDA and the public is going to start hearing more about this issue. I just hope the neighbors don’t complain too much about my backyard ranch until the FDA has heard enough to actually do something about it.